Who is Dana Magee? As founder of Rebecca Bitzer & Associates, I thought you would enjoy a monthly blog focusing on each of our dietitians AKA My Time to Brag about our AMAZING team. This month, I am featuring our dietitian Dana Magee. Dana has been with Rebecca Bitzer & Associates for SIX years! Originally from Pennsylvania, Dana had always had an interest in biology and considered going pre-med. As a young high school student she was accepted into an allied health program where she spent half of the day in the hospital setting shadowing physicians. She was even able to sit in on surgeries and spend time in the maternity unit with the newborns. 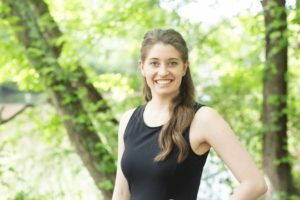 In this experience Dana had not yet found where in medicine she was passionate about and started at the university of maryland as an undecided student. 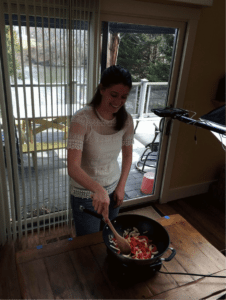 As a foodie, Dana has always had a love of food and the experience in college opened her to new food traditions, cuisines and people with a much different food experience. This lead Dana to attend a Dietetics workshop and the rest is history. Dana Graduated with her degree in dietetics and found her way to private practice working with RBA. 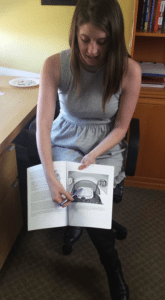 As co-author of Taste the Sweet Rebellion: REBEL Against Dieting Workbook, Dana helps readers improve their relationship with food and find joy in eating and cooking again. 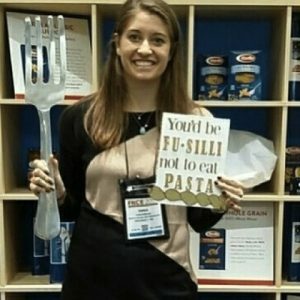 Here Dana is promoting pasta, a food that often gets vilianized by the diet industry, at the Food and Nutrition Conference in Boston, Massachusetts. Additionally, Dana is featured in our Mayhem to mealtime videos that illustrate just how quick and easy eating healthy can be. You can find these recipes in our Workbook and the videos on our website! One of Dana’s favorite tools to teach her clients about it intuitive eating and utilizing the hunger scale to better connect their mind and body and what they are eating. 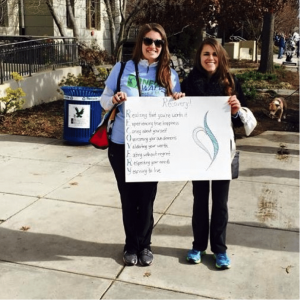 Here is Dana with fellow dietitian Alex at the NEDA walk raising awareness for eating disorders. Here is Dana at the annual meeting for the dietetic practice group that she is on the board of: Behavioral health nutrition. 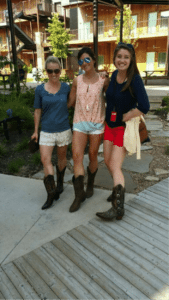 Her first trip to Texas- she really enjoyed wearing her cowboy boots ! Dana has been featured on both Laurel TV and Bowie TV for regular nutrition segments. 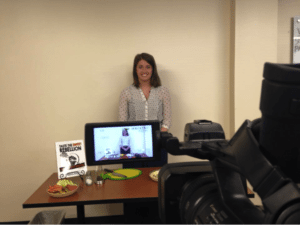 Here she is preparing guacamole (one of her favorites) and discussing healthy snacking! Dana sees clients in our Annapolis, Columbia and Greenbelt, MD locations. She has been with Rebecca Bitzer and Associates for 6 years! Dana LOVES wiener dogs! She grew up with 3 miniature dachshunds. If she sees one passing on the street she can’t help but ooo and ahh at them. Her lab mix Korra is going to have a dachshund puppy brother sometime soon! Her favorite animal is a flamingo because her favorite color is pink and their uniqueness intrigues her. Food favorites include pizza, summer tomatoes, hummus, chicken pot pie, broccoli, tacos and Ranch dressing! She recently got into yoga and have been loving the feeling she gets from it. In high school, Dana was part of a program that allowed her to shadow different clinicians and at just 17 years old she was able to sit in on amazing things including 3 surgeries and even spent time in the nursery with the newborn babies. But never once did they set her up with a dietitian! Once the science and food came together it clicked. Dana loves boots- all kinds but the most dear are her cowboy boots! Water! There is nothing more serene to Dana than lounging on a boat with the sun on my face and cold beverage in her hand. Dana got married last year to her boyfriend of 7 years- they met at the University of Maryland. He is a physical therapist at Anne Arundel Medical Center. There is nothing that makes Dana happier than when her clients are successful! HOW CAN YOU CONNECT WITH DANA?